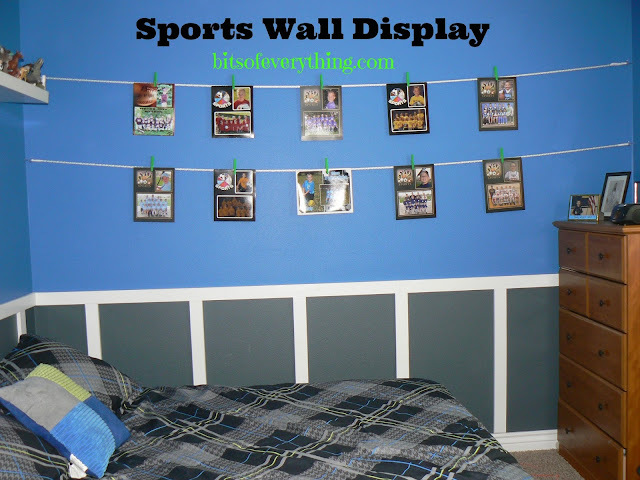 Okay, in case you missed it or didn’t take the time to click over to The Ribbon Retreat blog when we were featured, here is a tutorial on how I put together this Sports Wall Display. My son absolutely loves it in his room! We had a stack of sports pictures just collecting dust and I wanted to get them out and enjoy them. While my sister, Ashlee, was here, she helped me come up with this idea. The first step is completely optional. I wanted a pop of bright green for my son’s room, so I got some bright green spray paint and let him paint the clothespins. He thought that that was awesome! Next, we measured out where we wanted the hooks to go. I wanted at least two rows so that we can add more pictures as they come. We measured 16 inches down from the ceiling and then 16 more inches for the 2nd row. Then my husband helped me to tape the end of the rope in a loop that we put around the screw hooks. Hang the rope and then clothespin the pictures where ever you want! Seriously, I know he’s mine, but isn’t he cute? He’s a lot older now and I miss having him little. Go ahead and try it! You’ll be glad you did! 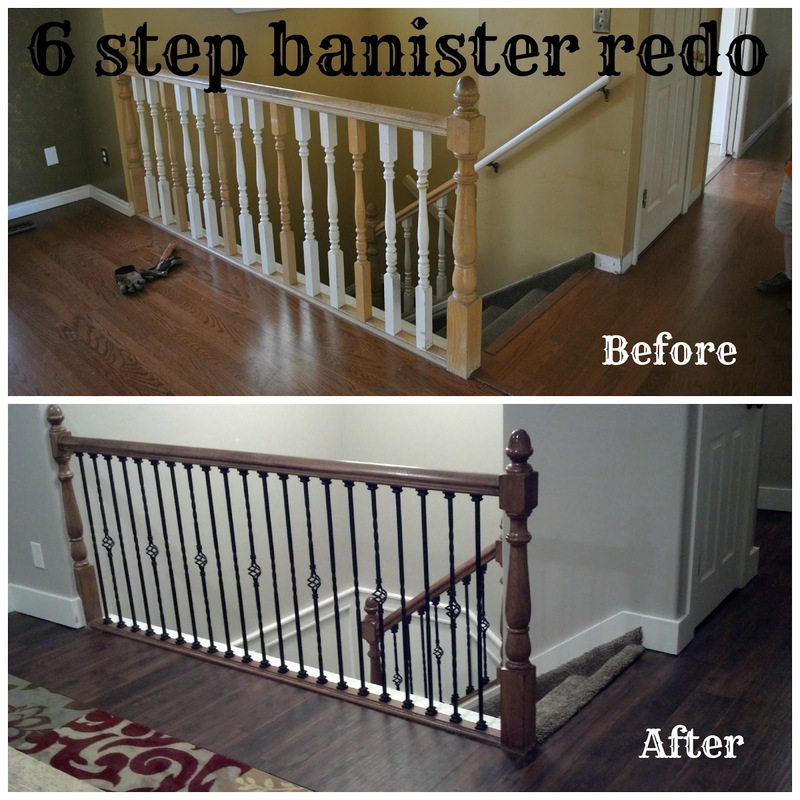 Her is how we did our Banister Redo, in just 6 easy steps! Guess what ladies!? We have a special guest writing for us today! He is my cute hubby. I love him. He is sweet, handsome, the best daddy, a great provider and I just recently learned how majorly skilled he is! He practically re-did this entire remodel we just bought. I’m really excited for you to see all the fun things we’ve done in our old new house! This is Mark- Natalie’s other half and the rest of the girls’ other fifth. We bought a house last summer and spent nearly every evening and weekend there for 6 months. We redid nearly every item in the home! Over the coming weeks Natalie will share many of our updates we did and try to give you an idea how we kept the budget tight! More pictures to follow! Today I’ll steal the keyboard and give you the first glimpse. 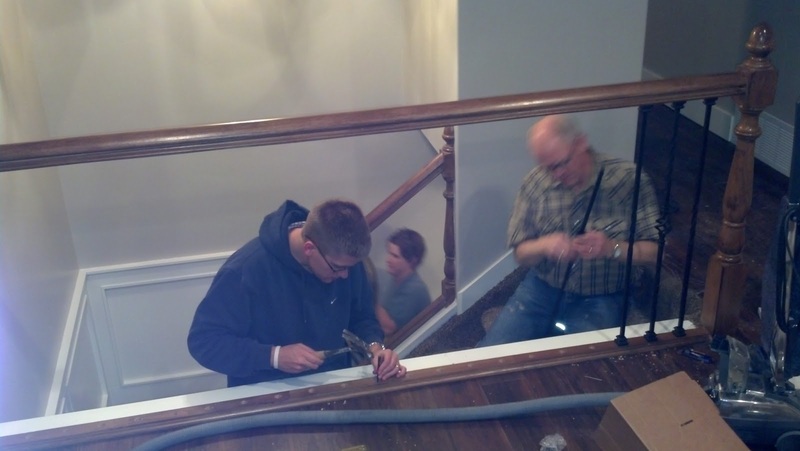 One of the projects where we saved a bunch of bucks was re-building the banister over the stairs. The old one was dated and really worn! 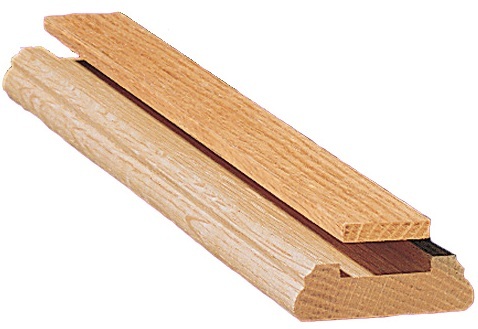 The contractor who came over to help give estimates before we started the demo thought a new banister would cost somewhere in the $1200-1500 range. So we got to work. Step 1: Cut the old balusters in half with a saw and pull them out of the railing. When you pull out the old balusters, you also must remove the fillet spacers between each old baluster. Step 2: Because we wanted to put wrought iron balusters in the new railing, we had to replace the fillet in the gap left behind by the old pieces. 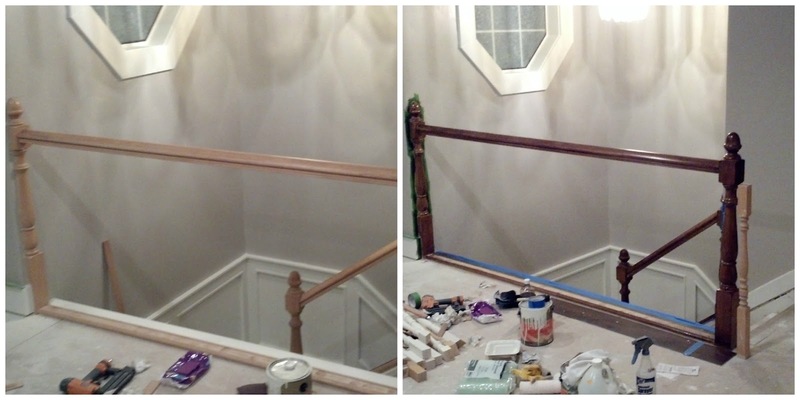 Step 3: Re-stained the hand rail. We decided to keep the railing and the end posts to the banister because it was still sturdy- and to cut on cost. We had help from N-Hance to change the color and put new finish on the rail. Step 4: The trickiest part of the job was the math. We calculated how many balusters we’d need to span the distance of the railing, and made sure to end with an odd number in order to maintain our pattern (every third baluster was a “basket” design). 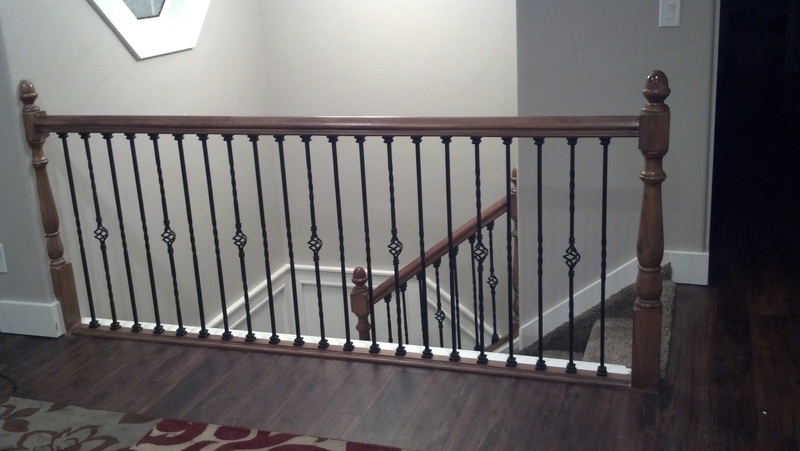 *Note: make sure you space the balusters according to code in your area. 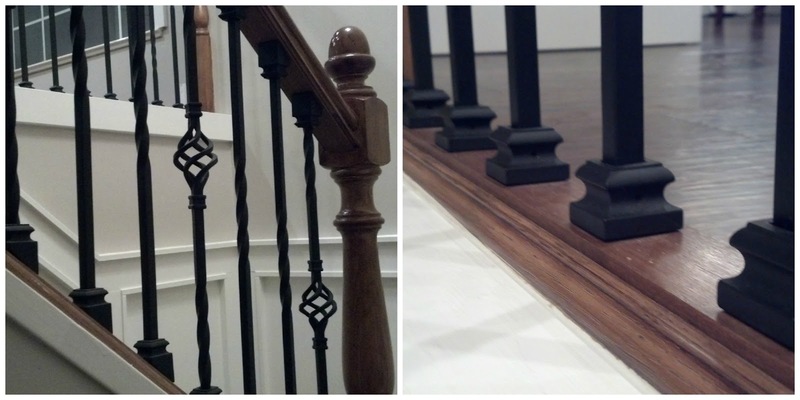 Step 5: The new balusters come in a standard length- longer than most handrails call for. We took ours to a local machine shop and told them how long to cut each one. Step 6: We drilled all the new holes on the top and bottom of the railing. We went only 3/4″ inch deep in the bottom and further into the top rail so we could slide each new baluster into the top and set them in the bottom to hold them all secure and level. We chose to install a ‘foot’ on the top and bottom for a finished look. Each baluster was glued in place and then the new feet clamps were tightened. The banister update has really updated our living room! We are thrilled with the results and it makes it even more enjoyable that we did it! We’ve only scratched the surface- watch for more of our projects in Natalie’s upcoming posts! As I have mentioned earlier, we recently purchased a home and have been remodeling it. Well actually my handsome hubby has been…I’ve just been making all the decisions. And, let me tell you-it’s been tough to make all those decisions! Color is something that can make such a difference in a home. 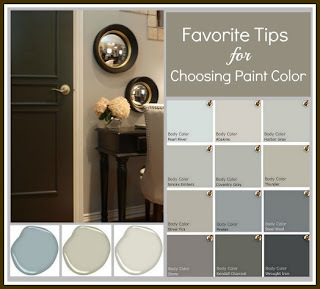 1) Start by thinking about the mood of the room. How do you want the space to make you feel? Tranquil? Lively? Romantic? That’s where color comes in! Different colors evoke different feelings, and it turns out those color-feelings are pretty universal. If you want your space to be passionate and stimulating, embrace red as the main hue. Red is the color of the heart and represents life and love. For a warm room that energizes, go for orange as the dominant hue. Orange used to be a “makes-ya-hungry” fast-food color, but techies and fashionistas know it has been reborn into a vibrant color of the future. Yellow is also high energy, but in an uplifting and cheerful way. When you walk into a yellow room, you can practically feel the sun shining on your face. Yellow is often associated with happiness and optimism because it can activate memory, stimulate the nervous system and promote creativity. Green is the color of nature. It creates an atmosphere that’s as friendly and comforting as the landscape around us. Blues are also abundant in nature and suggest the calmness and tranquility of clear skies and ocean waters. For a room on the contemplative and sensual side, pick purple — it combines the arousing qualities of red with the calming essence of blue. White is the color of purity and cleanliness, so use it to make a room feel clean and organized. The earthiness of brown makes a place seem grounded and unpretentious. Okay, so these didn’t really help me, but I thought they were interesting.